In my article “5 Things I miss From Team Fortress Classic“, I gave the very first spot on the list to its nailgun. Every time I’m stuck as Scout seeing a sentry around a corner, but with no means of dealing with it myself, I wish Valve hadn’t taken my simple and easy way to get rid of that darn thing. The TFC nailgun is most comparable to the TF2 Syringe gun, with a major difference: no gravity falloff on the projectiles, meaning that they fly in a straight line forever like a rocket. This lets you deal basically a stream of hitscan DPS on whatever you happen to be looking at, which translates into “great against stationary targets, rubbish against moving ones.” You can see where this is going. 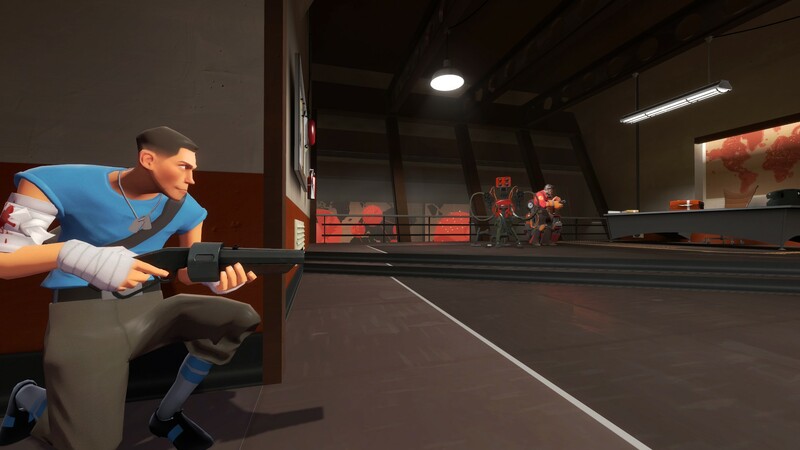 “Scout vs Sentry” is one of the few remaining counters in TF2 that has never been addressed, and largely considered the only ‘hard counter’; scout has little to nothing to offer against a sentry. His weapons just aren’t made to fight massive mechanical area denial tools that can soak and deal damage at insane degrees. What exactly should scout do right here? Answer: It really doesn’t matter. Picture by Gen. DeGroot. Once upon a time, this made sense. Most of the classes had weaknesses that were clear and defined, and they relied on teammates to deal with them. But in the TF2 of today, almost every class has a way to deal with their counters. Heavies can equip the Huo-Long heater and roast flanking scouts and spies. Snipers can equip razorback and jarate and detect enemy spies. Demoman can equip shields and solve their weaknesses to mobility and low relative base health. Pyro, the other class that gets wrecked by sentries, has the homewrecker. So why can’t scout get a nailgun, something he literally once had? It’d have a very clear downside too; as previously mentioned, it’s incredibly hard to use against moving targets. If you’ve tried to defend yourself with a Syringe Gun you know what I’m talking about. Giving up the pistol or scattergun for that is to lose a potent close-combat tool that works well against nine-out-of-nine classes. Plus, Engineer has received enough buffs recently. The new Short Circuit makes projectile spam a thing of the past for removing sentries. So how about we give somebody a new hitscan weapon to put buildings in their place? Spam and Spawn-camping: Legitimate tactics? I’d replace it with the Pistol and make it a quick projectile (Liberty Launcher-quick). But that’s just me. A replacement for the Primary and it offers both good way to deal with sentries and because it is Dps rather than burst damage(scatterguns), it might be good on defense Scouts. Now, I know that it fired straight ahead, but what if it fires straight and a mode to fire in a arc?